Square-Enix artist and designer Tetsuya Nomura is widely know for his work in the Final Fantasy series, designing characters and creating artwork for a number of recent entries in the franchise. 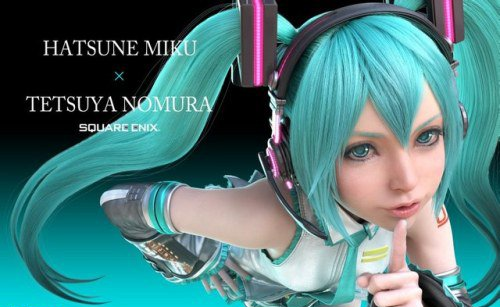 Earlier in October, Nomura unveiled his redesign for the popular Vocaloid character, Hatsune Miku, showing off her design in a teaser poster as well as a prototype figure at the Square-Enix booth at this year’s New York Comic-Con. Now, a promotional video that initially debut to select audiences at the Hatsune Miku Expo in New York last month has finally debuted online at Miku’s official YouTube channel! The short video, meant to demonstrate Miku’s and the Vocaloid program’s use as a creative tool, shows off her new Nomura design in a flurry of colors and cool-looking environments. Check out the video below, and keep a look out for more Miku and Vocaloid news in the future!